Over the past five (5) years I’ve taken at least fifteen (15) international trips and have had many more domestic excursions. Over time I have PERFECTED MY TRAVEL TECHNIQUE. It’s actually a fun experience for me! So I thought I would share all the fabulous items I take with me on trips (or on holiday as our European friends would say 😘). Before we start, let’s get one thing out of the way: I NEVER CHECK BAGS no matter where I’m going or for how long. 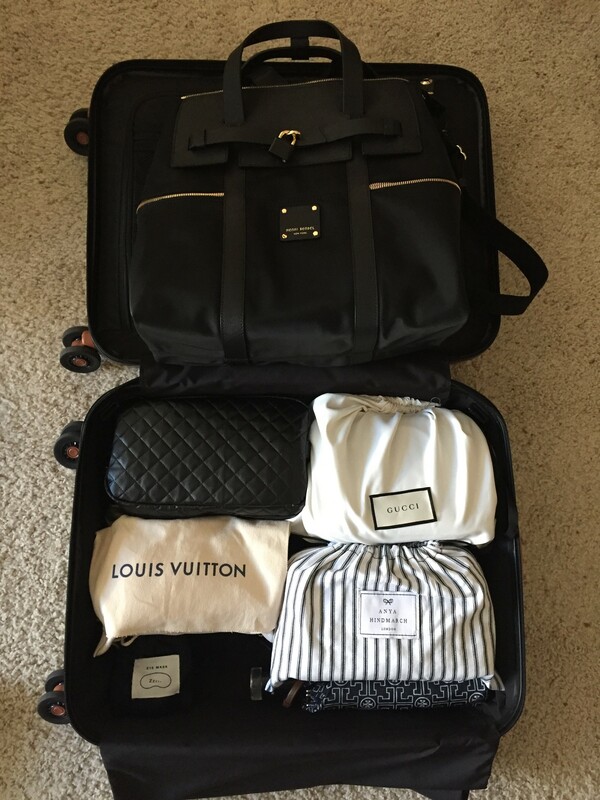 I’ve made a carry-on suitcase and a tote/backpack work for two-week trips to Europe so I know you can do it for a weekend getaway or even a week-long trip (with a little a lot of planning). 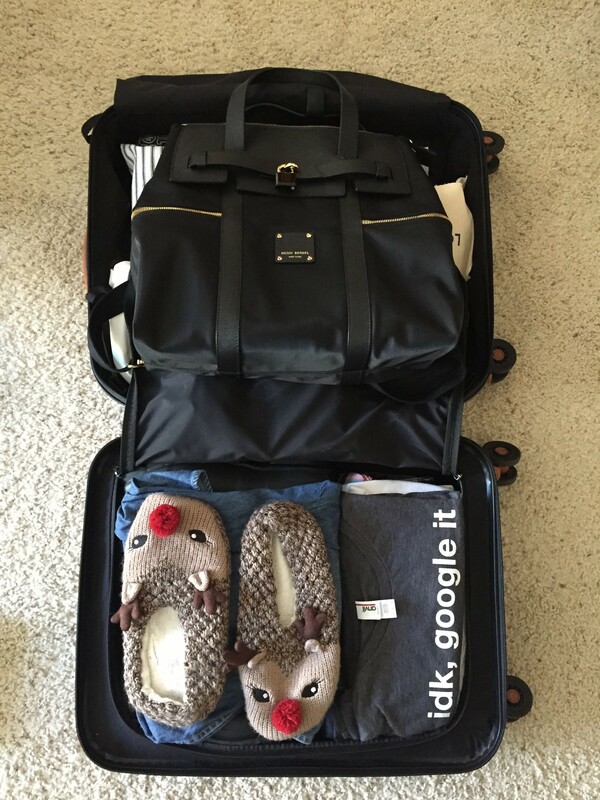 Travel mantra: Organize! Everything has a place and every place has a thing. 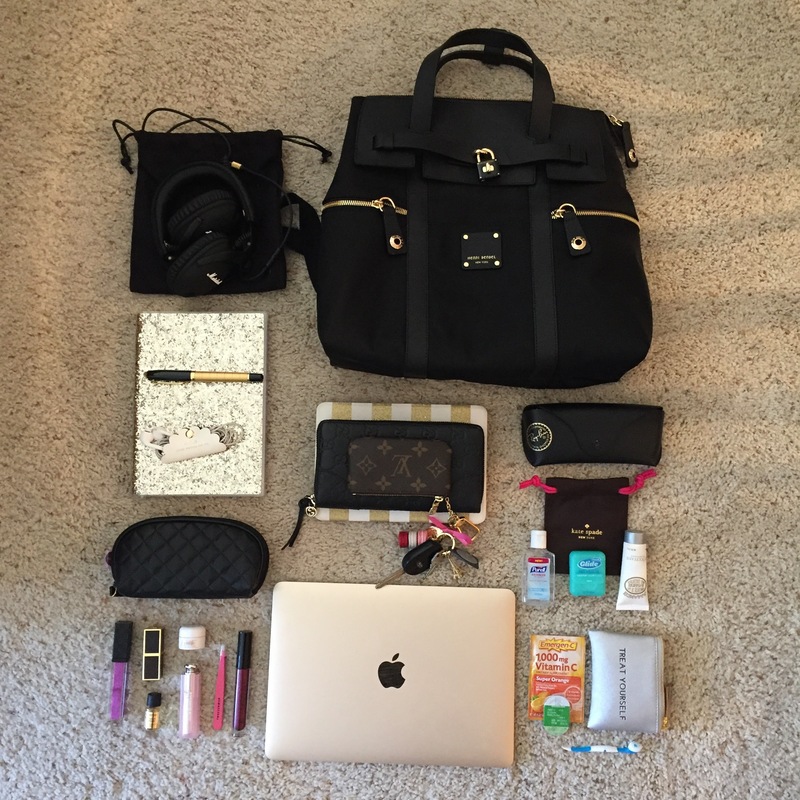 gold macbook, gucci zip around wallet, rayban aviator sunglasses, sessa vee pen, marshall headphones, l’occitane hand cream, iPad mini case, louis vuitton pouch, treat yourself pouch & earbud holder (sold out). Now, let’s move on to the SUITCASE, also known as the meat & potatoes of travel. I use Bric’s Belagio 21″ Roller. Underneath the Louis Vuitton Cosmetic Pouch is also a pouch that includes all of my techie-stuff. See below. Finally, there’s a sleep mask from J. Crew 🙂 This one is sold out but here’s another good option from Slip Beauty that’s also on my wish list. Finally, I have a Tory Burch umbrella (no longer available ☹️). Did you notice there’s no jewelry mentioned? That’s because I don’t wear much. I usually take 1-2 bracelets and it’s on me at all times: a dainty necklace, my pandora thumb ring, michael kors watch, some form of studs for earrings and my wedding ring – that’s it! Whew!!! That was fun! ☺️ And I still had enough space left to pack Christmas gifts for the kiddos! 🎁🎄 Happy packing!!! I’m on vacation this week (sort of) and will be experimenting with different types of posts. “What’s in my Bag Videos” have become very popular on YouTube (I watch them A LOT) and can be quite entertaining. A simple search for that phrase yields 4,450,000 results!!! The WIMB following is not a game! It kind of has the same feel as the #plannergirl community. You can find all types of handbags and all types of people sharing details about what they hall around with them on a daily basis and I abosolutely love it! So today I thought I would jump on the bandwagon and talk about what’s in my Gucci Soho Disco Bag! This video isn’t perfect – I recorded once and decided to roll with it. 💁🏽If you like the video, let me know! Links to purchase all items of significance are listed below. Oh and I forgot to mention that my phone is always in my bag. I just couldn’t show it because I used it to record this video.